Here the HIGH arc of the Sun has been charted, with the HIGHEST point noted. It is not at high noon, not high noon at 1:26 (13:26) as expected. but 6 minute earlier! On this chart, time of day is pink. The Sun is being tracked from East (right) to West (left) with horizon locations in blue, with 90° dead East, 270° dead West, and 180° due South, and the green angle of the Sun. Apr 2: Irrefutable evidence of trouble in Earth rotation. 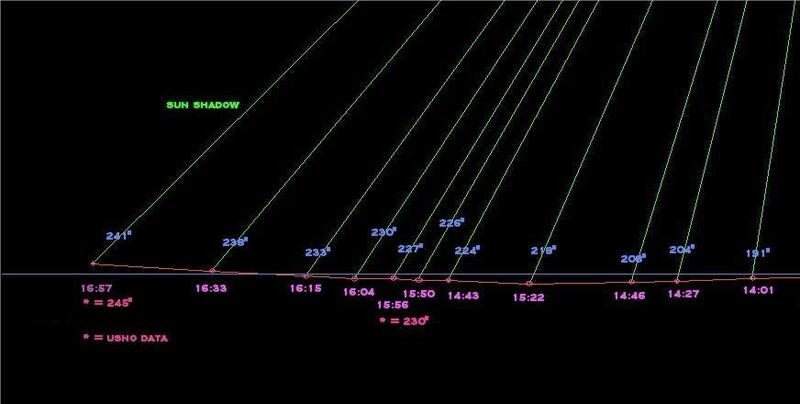 Sun positions during 6 hour around noon in Milan Italy. Noon, per USNO at 13:26. Skymap expects the Sun should be at Azi 180° at 13:26 DST, the highest point at Alt 50°, as going forward or backward in time brings no higher altitude.